Toby de Lys is a native New Yorker, who after residing in various major cities around the world, identified Bogota as the most promising emerging market capital city in which to found his new endeavor; Colombia Investing. In his role of CEO, de Lys spearheads business development strategies and investment advisory for Colombia Investing, in an effort to present investors with innovative emerging market vectors and high yield opportunities. Since permanently relocating to Colombia, de Lys also created the most viewed website about Bogota around the world, www.bogotabrilliance.co, along with Tigre Haller. Due to the success of their website, de Lys and Haller wrote the first bilingual guidebook about Bogota and the region, Bogota! A Bilingual Guide to the Enchanted City, published by Penguin, which was released internationally in June 2014. Through these and other critical endeavors on behalf of Colombia, de Lys has become a recognized expat leader in Colombia; clearly articulating the reasons why Colombia is booming, but more importantly – why Colombia’s well managed economy is now poised to grow at an unprecedented rate, providing fertile ground for the astute investor. Previously, de Lys was the international Project Manager for the Club Acquisition Company, an international resort and development company based in Denver, Colorado for six years, commencing in 2002. Prior to that, he was also V.P. of Operations for the New Millennium Development Company, a building construction and management corporation based in New York City. Toby de Lys received a B.A. in Architecture from a joint program between Princeton University and NJIT in 1990, and subsequently majored in Political Science and Philosophy at the City University of New York –at Hunter College. Later, for managerial purposes, he also studied at l’Ecole Hôtelière de Genève –Gestion et administration. He is native-level speaker of English, Spanish and French, and maintains a business level familiarity with other languages. 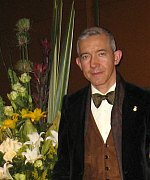 In his spare time, de Lys enjoys music, film and theatre, while occasionally curating significant art exhibits, and has founded the Bogota Bach Society.